Papadimitriou, D.; Fàbrega, L.; Vilà, P.; Careglio, D.; Demeester, P.
Aiming at creating a dynamic between elaboration, realization, and validation by means of iterative cycles of experimentation, Future Internet Research and Experimentation (FIRE) projects have been rapidly confronted to the lack of systematic experimental research methodology. Moreover, the "validation by experimentation" objective involves a broad spectrum of experimentation tools ranging from simulation to field trial prototypes together with their associated measurement tools. As experimental measurement results and corresponding tools play a fundamental role in experimental research, devising a systematic experimentation and measurement methodology becomes thus crucial for experimental research projects to achieve this objective for their various realizations, including protocols, systems and components. In turn, and in order to meet scientific validity criteria, the measurement results obtained when performing experimental research implies the availability of reliable and verifiable measurement tools, including on-line measurement data analysis and mining. Aiming at creating a dynamic between elaboration, realization, and validation by means of iterative cycles of experimentation, Future Internet Research and Experimentation (FIRE) projects have been rapidly confronted to the lack of systematic experimental research methodology. Moreover, the “validation by experimentation” objective involves a broad spectrum of experimentation tools ranging from simulation to field trial prototypes together with their associated measurement tools. As experimental measurement results and corresponding tools play a fundamental role in experimental research, devising a systematic experimentation and measurement methodology becomes thus crucial for experimental research projects to achieve this objective for their various realizations, including protocols, systems and components. In turn, and in order to meet scientific validity criteria, the measurement results obtained when performing experimental research implies the availability of reliable and verifiable measurement tools, including on-line measurement data analysis and mining. Papadimitriou, D. [et al.]. 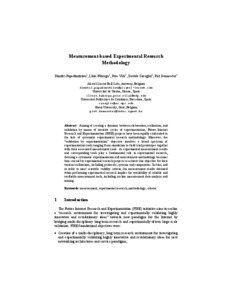 Measurement-based experimental research methodology. A: European Workshop on Measurement Methodology and Tools. "Measurement Methodology and Tools: First European Workshop, FP7 FIRE/EULER Project: Aalborg, Denmark, May 9, 2012: revised and extended papers". Aalborg: Springer, 2013, p. 5-22.